It’s that time of the year again, when thousands of riders and bikes descend on the bustling French resort town of Biarritz for the Wheels & Waves festival. 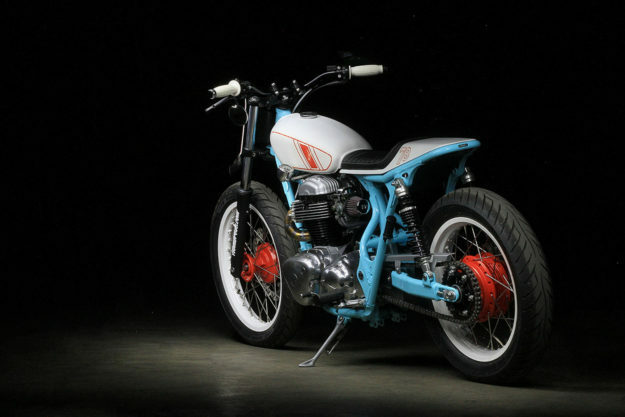 One of those bikes will be this fresh-looking Kawasaki W650 tracker—and it’s a perfect match for the moto-meets-surf vibe. Builder Uwe Kostrewa of Hombrese is already in Biarritz, after an 800-mile jaunt from his hometown of Cologne in Germany. And there’s a chance he’s picked up a few fines on the way. 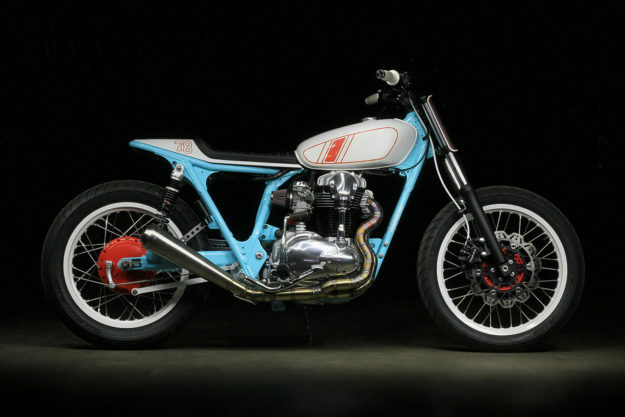 Germany’s TÜV regulations are draconian, so Uwe’s W650 tracker is slightly more legal than most of his builds. “In Germany you are not allowed to do whatever you want with a bike,” he explains. Uwe has been riding long enough not to care any more. He started at thirteen—on a Honda monkey bike. 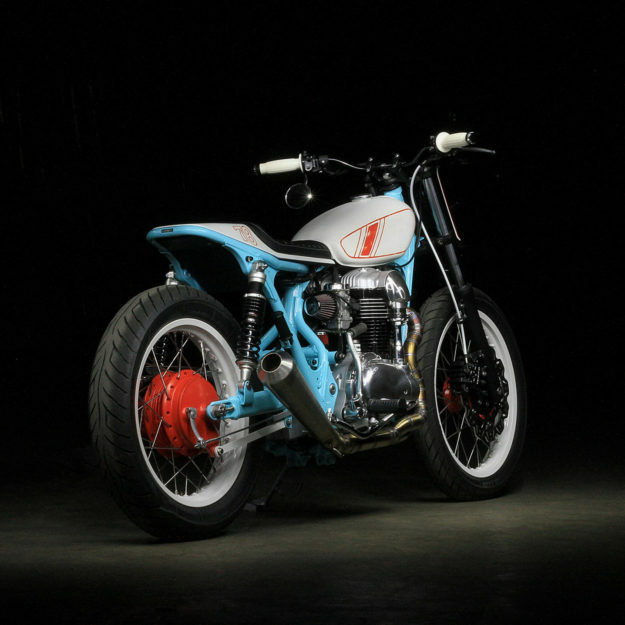 From there he worked his way up to bigger engines, until someone else’s Yamaha SR400 café racer caught his eye. 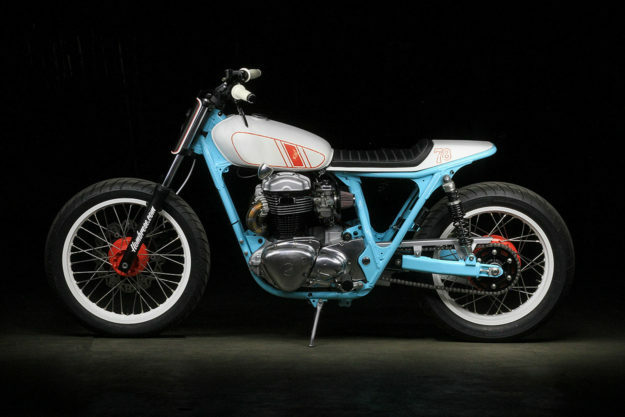 Uwe was smitten—he bought a SR500 donor, dragged it into his workshop and built his first custom motorcycle. That was four years ago. Since then he’s been spending his after-work hours building bikes for himself and close friends, for the pure joy of it. “I’m not happy when I don’t have a tool in my hands,” he says. 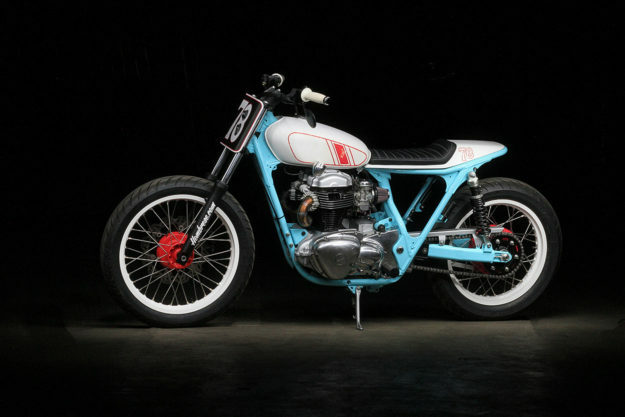 This 1999-model Kawasaki W650 is Uwe’s fourth personal build. It’s also the fourth bike in his garage, since he can never bring himself to sell any of his own projects. 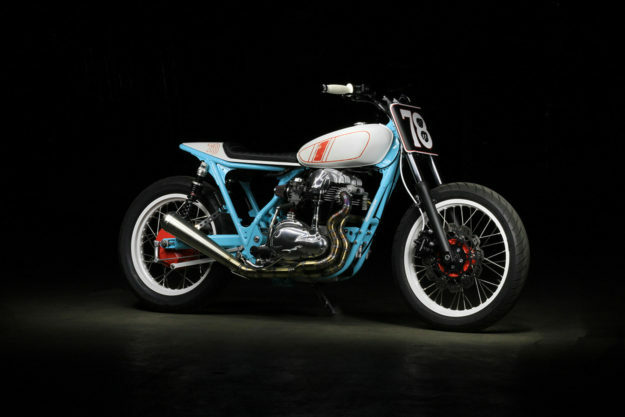 “When I saw the W650 for the first time, I fell in love with the engine,” he tells us. “I thought it was the perfect base for my next project. The bike’s been completely torn down and built up. Uwe de-tabbed the frame, shortened the rear and embedded a small LED taillight in the new loop. 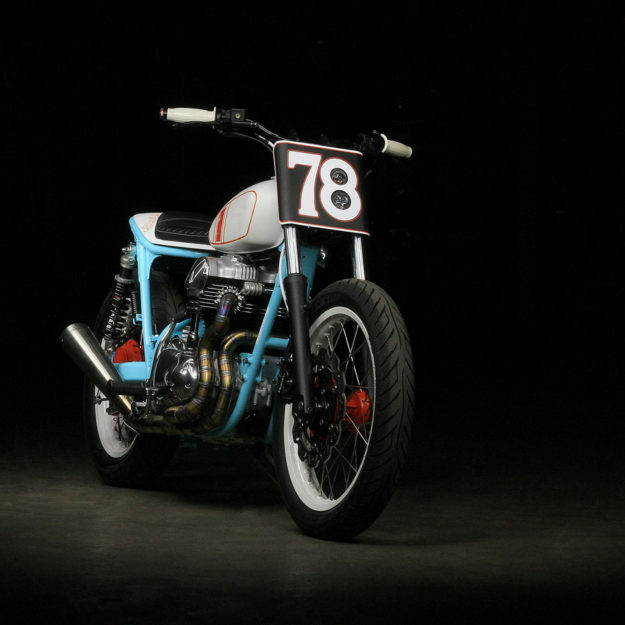 Sitting up top is a fiberglass, flat track-style tailpiece, hand-shaped by Uwe. The tank’s an eBay find—originally off a Yamaha of undetermined model. Up front are new handlebars and grips, mated to the stock switches. 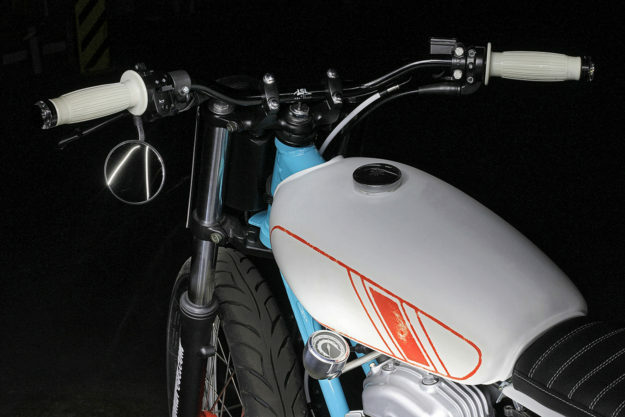 The headlight’s been ditched for a hand-made number board, equipped with LED lights from Highsider. 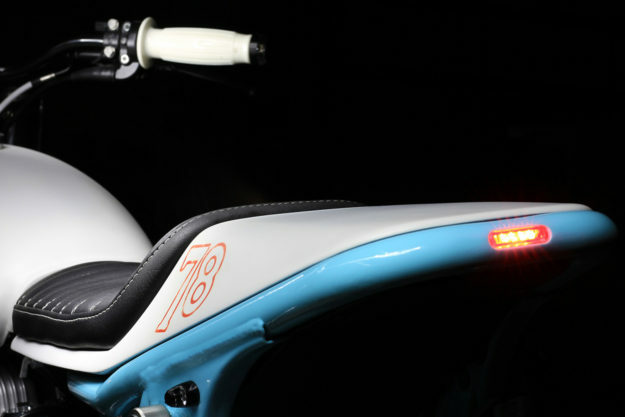 The bar-end turn signals (and the tiny turn signals at the rear) are from Motogadget, as is the side-mounted speedo. The front forks have been shortened slightly, and there are new YSS shocks at the rear. Uwe stripped the wheels, had the rims and hubs powder-coated, then rebuilt them with stainless steel spokes. 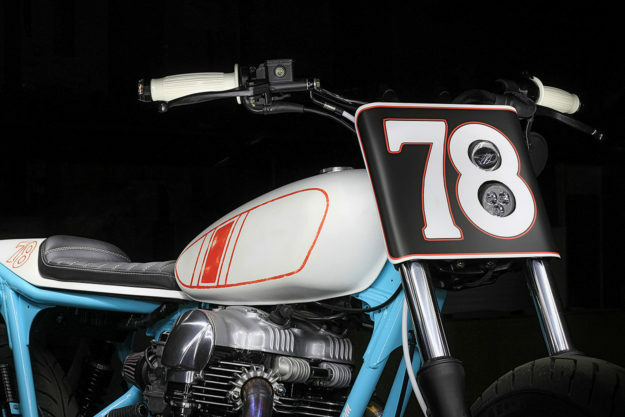 Those concerned with appropriate tire selection can breathe a collective sigh of relief: this Kawasaki’s kitted with sensible Avon Roadriders. Uwe tossed the airbox and fitted a pair of K&N filters, relocating various electronic components in the process. 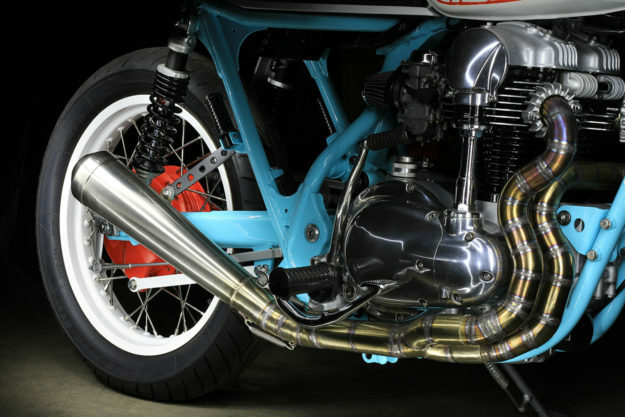 He built the exhaust too: a curvaceous two-into-one system terminating in a MotoGP can. Uwe sent the frame off for base powder coating, before finishing it in a striking bright blue himself. Most of the finishings are his own work: from the polished and painted bits on the engine, to the distressed livery on the fuel tank.